Robert joined Wace Morgan 3 years ago having previously been a partner at another Shrewsbury firm. Expertise in financial disputes arising out of relationship breakdown, essentially dealing with High net worth professional and commercial clients. He also specialises in Forces pensions issues. 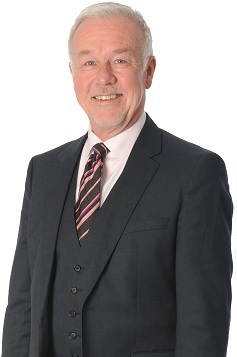 He qualified as a solicitor in 1981 after obtaining Law degree at Birmingham University in 1978 and undertaking solicitors qualifying course at Chester College of Law in 1978/9. Trained in Birmingham and then practised in Staffordshire/ North Warwickshire and Birmingham before moving to Shropshire in 2003. Qualified as a family mediator in 1999. Outside interests – football, cricket (now retired but still watch on regular basis), travel, music and good food. “I would also just like to say thank you to you Robert. When I first met you I was in a very different and difficult place. I was struggling and although your firm had been recommended by friends, I knew nothing of you and took an appointment offered with you as I frankly just needed help quickly! Then I saw your profile and that you had experience in dealing with forces pension issues and I just knew you were heaven sent!